It’s amazing to witness how an idea in 2004 has grown from a dream, without funding or infrastructure, into a thriving organization! 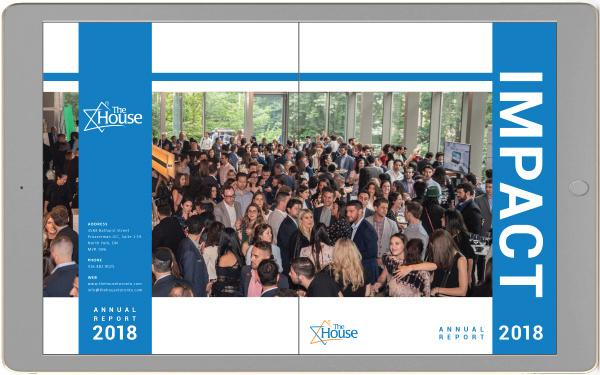 Over the past 10 years, The House has engaged thousands of young Jewish adults through innovative Jewish educational programming, inspiring them to find personal meaning in Jewish tradition. Whether navigating life’s critical junctures or managing day-to-day life, The House empowers young adults to see Jewish wisdom and values as positive and relevant, contributing to their choices in their personal, professional and communal lives. “Inspiring Jewish Minds; Transforming Our Jewish Future” is an exciting campaign to invest in the tremendous potential of the next generation that has been nurtured by The House. Today, the young leaders, inspired by the Jewish ideas that they were exposed to at the House, have taken ownership of our mission. Their commitment to sharing their inspiration and educating others, clearly defies those who predict an apathetic Jewish future, and is nothing short of inspiring to us all. This generation is reshaping our Jewish future. Our next horizon is far more than simply growing annual participation from 1000 to 5000 over the coming years. We are looking beyond numbers with a vision to transform the entire pulse of Jewish continuity. We are inspiring a new generation of young Jewish adults, meeting them where they are and giving them what they need to lead meaningful Jewish lives. Not satisfied with simply slowing down the increasing numbers of assimilation, we are going to reverse the trend. It is starting to happen as we speak, and The House is empowering our next generation to lead the way! We would not have reached this exciting 10-year milestone without the generous support of those visionaries who believed that dreams can transform into realities. Thank you. On behalf of our young leadership board, executive board, staff, and the thousands of young adults inspired by The House, Toda Rabbah!